battery and a titanium Ducati Performance by Akrapovic exhaust will take you and 357 lbs of racing technology straight to the checkered flag. The Panigale R, which is the homologated base for its World Superbike machines is essentially a road-legal race bike with indicators and lights. Fitted with the 1198 cm3 Superquadro engine, thus falling within Superbike displacement limits, it boasts titanium intake and exhaust valves and rods, two-ring pistons and an extremely lightweight crankshaft which is balanced with tungsten inserts, to guarantee a maximum power of 205 hp at 11,500 revs/minute and a torque of 136.2 Nm at 10,250 rpm. The new electronic kit, studied specifically for the Panigale and integrated in the three different Riding Modes, makes it even more high-performance. Thanks in fact to the presence of the Inertial Measurement Unit (IMU), Cornering ABS is made available, along with Ducati Wheelie Control (DWC). Moreover, the Ducati Quick Shift (DQS) now works also during down-changing, to further improve track performance and to make the bike more easy to use on a daily basis. 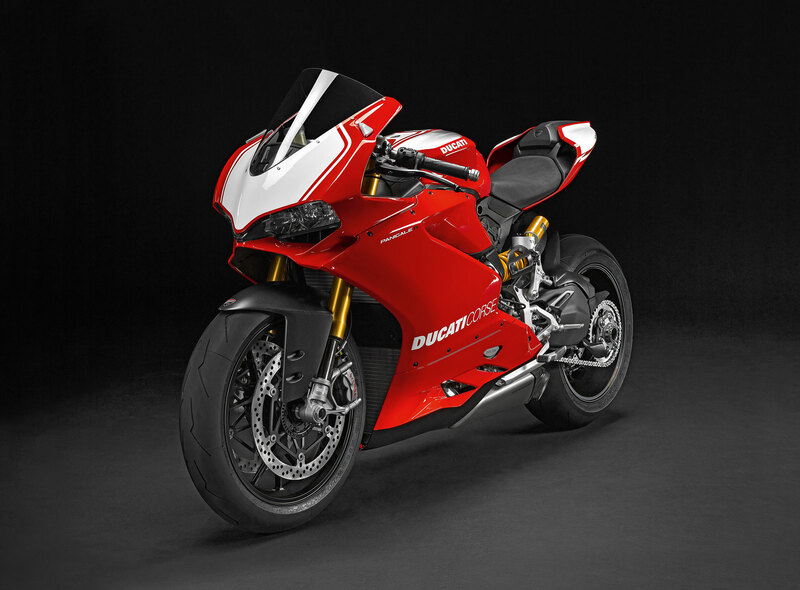 On the Panigale, the Ducati Traction Control (DTC), Ducati Wheelie Control (DWC) and the Engine Brake Control (EBC) have been optimised by an automatic calibration system which allows for easy changes in tyre size and final drive ratio. The Panigale R is also fitted with Ã–hlins mechanical suspension, an adjustable swingarm pivot and the same electronic technology as the 1299 Panigale, as well as a lithium ion battery which means a reduction in weight of over 2 kg, making it a total of 6 kg lighter than the 1199 Panigale R.
For the 2017 Ducati Superbike family, the new 1299 Panigale and 1299 Panigale S models will sport the latest versions of Ducati Traction Control (DTC) and Ducati Wheelie Control (DWC) known as EVO versions. These systems , introduced for the first time on the exclusive 1299 Panigale S Anniversario, bring performance and active safety to unprecedented levels on the Bologna-built Superbike. The new DTC and DWC EVO act according to a brand new algorithm which enables each to intervene faster and with greater precision. 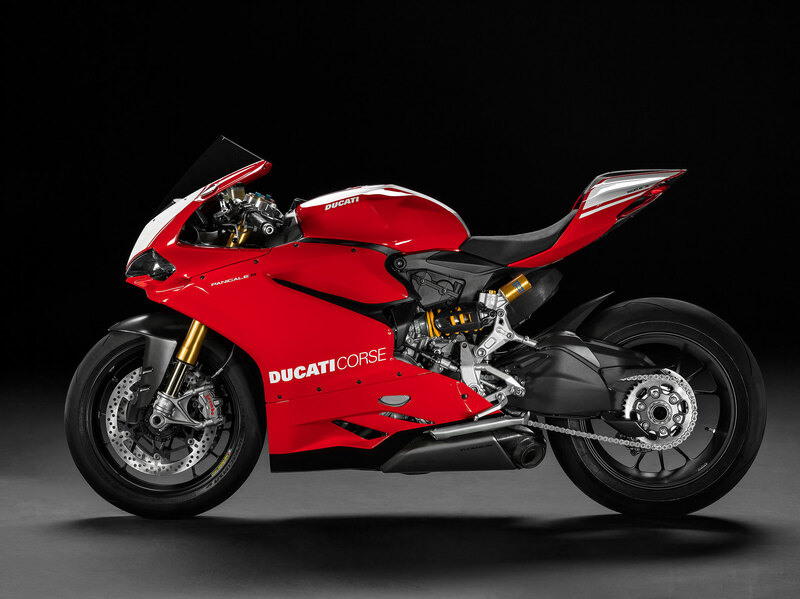 The 2017 Ducati Superbike family includes the 959 Panigale which teams up with the 1299 Panigale, the 1299 Panigale S and the Panigale R – all featuring the Superquadro engine as a stressed member of the chassis and a compact, die-cast aluminium monocoque. The Ducati 959 Panigale shares the same innovative stylistic features that characterise its ‘bigger brother’, the 1299 Panigale – but with an engine designed for a more enjoyable everyday riding experience and more thrills on the race track. The 955 cm3 twin-cylinder engine, the first Superquadro to have obtained Euro 4 type-approval, comes with a new stroke length and other innovations that have given rise to an even more impressive torque curve. The Panigale R, from which Ducati’s World Superbike race bike is directly derived, is equipped with the top-performing version of the 1199 cm³ Superquadro with 112 x 60.8 mm bore x stroke. Its maximum power is 205 hp at 11,500 rpm while its maximum torque reaches 136.2 Nm at 10,250 rpm. The Panigale R is also fitted with Ã–hlins mechanical suspension and it has a steering angle of 24° and a swingarm pivot that can be adjusted among 4 positions. 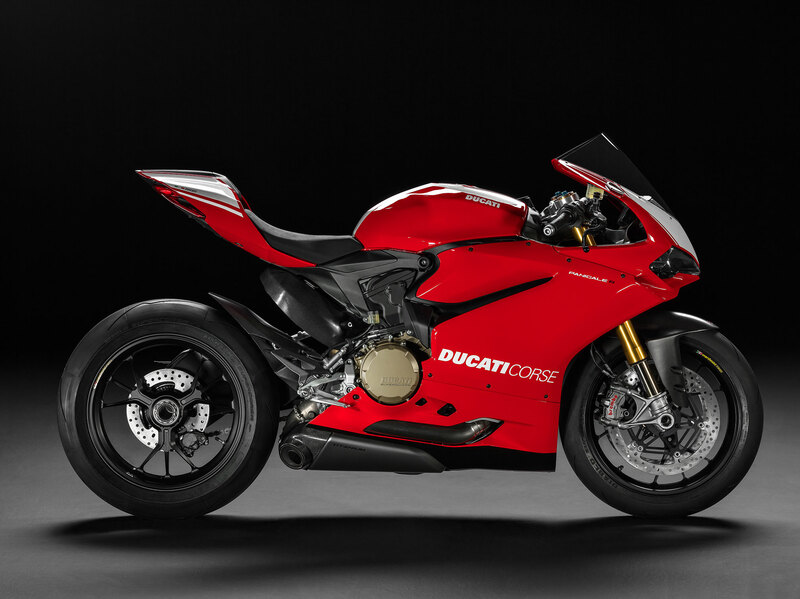 In addition it has dedicated steering offset geometry which advances the front axle by 5 mm compared to the 1299 Panigale and the 1299 Panigale S (with relative increment of the wheelbase distance from 1,437 mm to 1,442 mm), in order to further increase stability particularly in conditions of extreme track riding or racing. The Panigale R is fitted with a number of parts made in carbon fibre and, thanks in part to the use of the approved Akrapovic titanium silencer and the extremely lightweight lithium ion battery, the Panigale R weighs 6 kg less than the 1199 Panigale R. The bike use also an air filter with high permeability Sprint Filter P08. 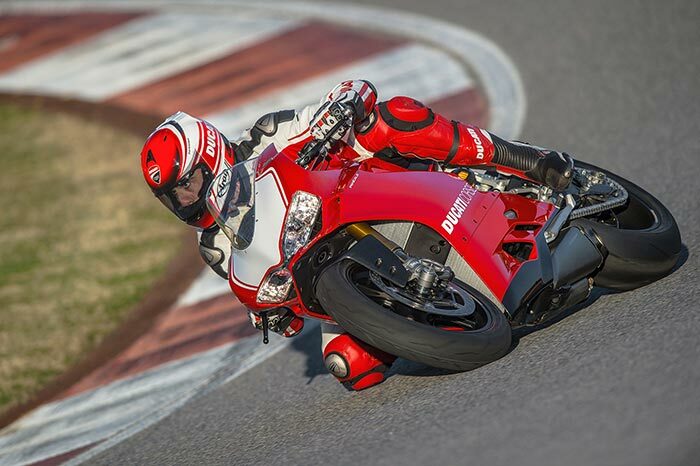 The Panigale provides a new benchmark for electronic systems. The highly advanced electronic kit is supported by the Inertial Measurement Unit (IMU) which measures acceleration in relation to three axes and calculates the bike’s angle of roll and pitch. The IMU has made it possible to increase the performance of the electronic kit, introducing Cornering ABS, Ducati Wheelie Control (DWC). For the first time, the Ducati Quick Shift (DQS) functions also for downshifts. Furthermore, the Panigale is equipped with the Ride-by-Wire (RbW) system, the Ducati Data Analyser (DDA+) and the Ducati Riding Modes, which interact differently with the Ducati Traction Control (DTC), the Ducati Wheelie Control (DWC), the Ducati Quick Shift (DQS), the Cornering ABS, the Engine Brake Control (EBC). The impressive provision of electronic devices also includes auxiliary buttons on the handlebars, as on race bikes, to regulate the DTC, DWC or EBC systems during track use. The DTC system, a great Ducati success story, has been perfected even further for the Panigale and entirely integrated in the electronic kit for all the versions. It makes use of the software logic created for the Ducati Corse models used by the World Champions of MotoGP and Superbike and provides a choice of eight profiles developed by a team of riders and professional test-riders. EBC (Engine Brake Control) was perfected by Ducati Corse in order to help riders optimise the stability of their vehicle in extreme conditions and when entering a turn, during races for the MotoGP and Superbike world championships by balancing the force acting on the back tyre in situations of intense engine braking. The EBC monitors the position of the throttle valve, the selected gear and the deceleration of the crankshaft during extreme braking and it regulates, with great precision, the opening of the throttle activated by the Ride-by-Wire system to adjust the back-torque applied to the tyre. The EBC has three setting levels accessible from the instrument panel of the Panigale and integrated automatically into the three Riding Modes in order to assist the rider still further in an extraordinarily efficient way. The TFT (Thin Film Transistor) instrumentation of the Panigale makes use of the most advanced technology in the field of data visualisation. The configuration of the colour display can be modified and it adjusts automatically to the selected Riding Mode in order to provide the clearest possible display of the information according to riding conditions and it even inverts the colours of the characters and the background in situations of very low visibility. The high definition instrument panel shows rpm between 1,000 and 12,000 on a display with a 90° angle at the far top left corner of the main screen, adding increasing luminous bars to the display as the engine increases in speed and enlarging the main digits of the index (from 1 to 12) one by one, when the corresponding value has been reached. In the lower part of the display, from left to right, the current state and/or the settings of the Riding Modes are shown while the right-hand part of the screen contains a gear indicator. When the Track visualisation mode is selected, for the first time, the lean angle is also displayed. If the Lap Time function is activated on the instrument panel, the highest speed and maximum lean angle of each lap are also shown when the individual times are visualised. With the Ducati Data Analyser (DDA), which includes Mac-compatible software and a USB data recovery device, it’s possible to evaluate the performance of the bike and the rider, with graphic presentations for specific areas of data. The DDA+ GPS is the latest generation of the Ducati Data Analyser with GPS function and it automatically records the timing of each lap every time the Panigale crosses the finish line of a racetrack. When the rider, crossing the finish line, presses the high-beam flash button, this highly innovative system records the coordinates of the position and then records the timings of each successive lap once it’s been completed. Riding Modes, Power Modes, Cornering ABS, DTC, DQS up/down, DWC, EBC, Fully RbW, DDA+ with GPS and lean angle acquisition, Auto tire calibration, Titanium connecting rods and valves, balanced crankshaft. Lithium-ion battery. Auxiliary adjustment buttons.